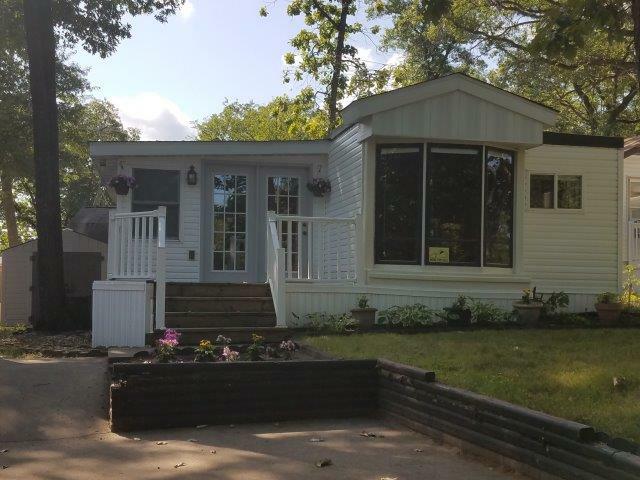 Carefree Country Club is comprised of various models of recreational vehicles (most being Park Models) surrounded by shady oak trees and many with views of Fawn Lake or the golf course. 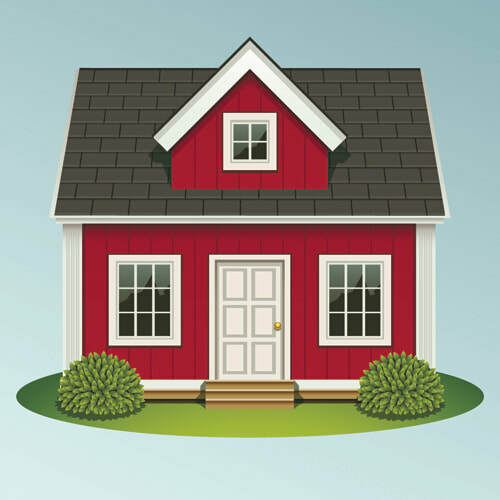 Members of the community may add up to 400 square feet of additional living space to their recreational vehicle. The abundance of trees creates a sanctuary for bluebirds, woodpeckers, orioles, cardinals, sandhill cranes, deer, and other wildlife. Showings by appointment only. Contact the resales office at 763.688.3573. A 1987 Heritage Park Model with a Minnesota room. There are two bedrooms, a LP furnace, an electric heat pump with both heating and air conditioning, is partially furnished and has 4 ceiling fans in a non-smoking home. Also included is a gas stove, a microwave, a 2013 refrigerator and a washer & dryer. There is a double wide driveway, a wired storage shed and two electric golf carts. A new roof was installed in 2017… see resales information sheet for additional items. Owner description: This park model offers a beautiful panoramic view of the lake through two sets of double doors in the MN room. You will feel relaxed in no time! The Minnesota room is open and roomy with a ceiling fan and a pull-out couch for your guests. Another plus to this unit is the full-size washer and dryer - no trips to the laundromat needed! Other features include one bedroom with a queen bed, window air conditioning, LP furnace, 3 ceiling fans, gas stove, a full-size refrigerator, built-in microwave and plenty of cupboards and storage. There is a wired storage shed and two electric golf carts - a 1987 Club Car and 1990s EZ-GO. This is a non-smoking, non-pet home. Stop and take a look today! A 2000 Breckenridge park model with a loft and a den. This unit has 1 bedroom, a LP furnace, a gas stove, a refrigerator, central air conditioning and a built in microwave. It is located on a perimeter lot with a double wide driveway and a wired storage shed. There is a fire pit and a large side deck. A 2000 Chariot Park Model with a 12 x 18 Minnesota room. There are covered front & back patios, 1 bedroom, electric heat pump heating and full house air conditioning. The unit is partially furnished, has 3 ceiling fans and is a non­smoking, non pet home. Also included is an electric stove, a refrigerator, a microwave, a stacked washer and dryer, double wide driveway and a partially wired storage shed. A 1988 Kroft Park Model with a 200 sq ft Minnesota room. There is one bedroom, an electric heat pump with both heating and air conditioning, completely furnished and 1 ceiling fan in a non-pet and non-smoking home. Also included is an electric stove, a dishwasher, a microwave and a washer & dryer. With a wooded back yard, there is a double wide driveway, extra cement, a wired storage shed and a 1999 EZ-Go electric golf cart with new batteries in 2018. The roof and windows were new in 2010 and the floor was new in 2012. A 1983 Elkhart Park model with a 14 by 14 Minnesota room and a 10 by 26 covered patio. There is 1 bedroom, a LP furnace, window air conditioning, 3 ceiling fans, a gas stove, a built-in microwave (2013) and a refrigerator. This unit is a non­smoking home, has a double wide driveway, a wired storage shed and includes a 1998 electric EZ­GO golf cart. Owner description: 1994 Breckenridge Park Model with 400 sf Minnesota room. LP furnace & central air in park model. Window unit in MN room. Double concrete driveway w/concrete cart path to back. Concrete patio in back. (New in 2014.) Large fire pit on lakeside common ground (new in 2015.) Wood storage shed, wired w/loft storage and overhead garage door. All new windows in part model – 2015. New refrigerator in 2015. New microwave in 2016. 2 flat screen TVs – 32” new in 2018. Stackable washer & dryer. 3 ceiling fans. Partially furnished. Comes with 1 gas EZ Go cart. ​A 1986 Hornet Park Model with a Gazebo. This is a one bedroom unit, with a LP furnace and window air conditioning. It is completely furnished, has two ceiling fans, is a non-smoking, non-pet unit with a gas stove, a refrigerator and built-in microwave. It has a double wide driveway with a storage shed and a 1998 EZ GO gas golf cart. A 1987 Golfstream Park Model with Minnesota Room. Two bedrooms, L.P. furnace, wall and window air conditioning, 2 ceiling fans and a gas stove in an unfurnished unit. There have been no pets or smoking in this unit with a park view, wired storage shed and an electric Club Car golf cart. New siding and windows in 2015, Minnesota room in 2016 and blacktop in 2017. Note: owner has a partially completed Minnesota room and is willing to negotiate the price if they are willing to finish it. A 1984 Holiday park model with 400 sq. ft. Minnesota room including 3 season porch. This unit has 1 bedroom, a LP furnace, a gas stove, a refrigerator, central air conditioning and a built in microwave. It is partially furnished, has 4 ceiling fans, is a non-smoking, non-pet home, is located on a perimeter lot with a double wide driveway and has a wired storage shed. A 2004 four seater EZ GO is included. This 1989 Canterbury park model has a 16x15 Minnesota room, 1 bedroom, a LP furnace, air conditioning, three ceiling fans and is completely furnished in a non­ smoking, non pet home. Also included are a gas stove, a microwave and a 18.2 cu ft refrigerator. There is a double driveway, a storage shed and a 1992 electric Club Car golf cart. Owner description: 1991 Fuqua Sunridge Part Model with 1 bedroom – large mirrored closet, extensive storage; 2 ceiling fans; furnished unit. All electric appliances, stove, refrigerator, built-in microwave, extra refrigerator in porch. 15x13 screened porch includes iron table, 6 chairs w/cushions. Unit has large back deck with patio table, umbrella & 4 chairs w/cushions and 2 lounge chairs. Perimeter lot with double wide driveway, extra cement; rock coverage (no grass to mow.) 10x10 storage shed w/shelving on 2 sides. Quiet location – backs up to quiet wooded area; front faces John Wayne common grounds. Bathroom completely remodeled in 2017, includes shower, elongated high-rise toilet, vanity & cabinet, tall wall cabinet & over tank cabinet, new linoleum flooring. A 1983 Cree park model remodeled in 2018. Completely furnished, there is 1 bedroom, an electric heat pump, central air, convection oven, a gas stove with a self-cleaning oven, a built-in microwave and a refrigerator with a ice maker. There are washer/dryer hookups and the roof was new in 2012. 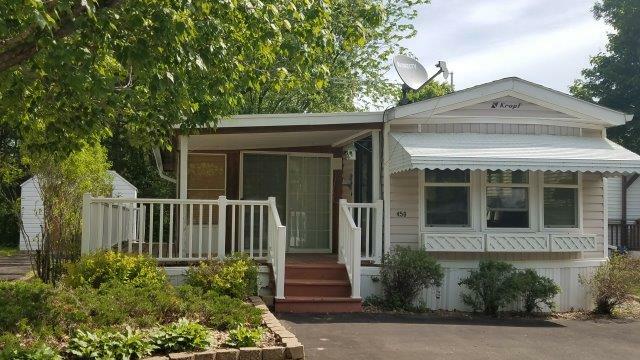 This unit is a non­smoking and non-pet home, has a double wide driveway which was resealed in 2017, a storage shed and includes a 1980 gas EZ­GO golf cart. A 1983 Elkhart trailer with one bedroom. A gas furnace, roof air conditioning, gas stove, microwave and refrigerator are included in this non-smoking, non-pet home. There is a lake view, extra cement, a storage shed and a 10 x 25 awning. A 1993 gas EZ-Go is also included. A 2001 Summerset Park Model with a 400 sq ft Minnesota room. There are two bedrooms, electric heat, 3 ceiling fans is partially furnished and is a non-smoking / non-pet home. Also, includes a gas stove, 19 cu ft refrigerator with a ice maker, a washer / dryer and a built-in microwave. There is a double wide driveway and a wired storage shed. A 1986 Mallard Park Model with a Minnesota room and a 2nd bedroom/den addition. A gas furnace, electric stove, built in microwave, refrigerator, washer/dryer, 2 air conditioners, 3 ceiling fans. Property is smoke/pet free. Wired shed w/storage loft, lawn mower. A front & back deck. A pleasant back yard, fire pit, open view of the wetlands. Large parking area. A 2002 gas Yamaha golf cart w/extended back seat. Owner description: Maintenance free yard, no grass, new rocks in 2018, beautiful flowers in front. This model was updated in 2009: new light fixtures, drapes, medicine cabinet and carpet in bedroom. Completely furnished 1 bedroom with sleeping area in MN Room. New faucets in kitchen and bath in 2017, 2004 18 cu. ft. refrigerator, 2004 washer/dryer, only used last 4 years and triple wide asphalt drive completed in 2016. Furnace and stove are both lp gas and there are 3 AC window & mobile units. Nice light oak cabinetry throughout. Full tub/ shower in bath with a skylight, built in microwave, ceiling fan, wired utility shed. This is a no pet, non smoking home on a true perimeter lot with woods in front and common area in the rear. A 2006 Yamaha gas cart, bought refurbished in 2014 is included. Corner lot completely landscaped with two driveways (lower and upper) across the street from natures wetlands. The back side abuts commons area. Storage shed includes additional storage loft. New skirting and gutters in 2011. The large deck is accessible from the lower driveway, bedroom and living room. A small catwalk deck enhances the front view. There is a 7 zone underground sprinkler system. Propane gas grill and lawn mower are included. This unit was totally remodeled in 2006 – wiring, plumbing, addition, bathroom counter, new carpet, laminated wood flooring in kitchen/dining room and the decorative blinds and valances were added. A new roof in 2014. There are five rooms: 2 bedrooms, bath, kitchen/dining room and living room. Property has central heat, a/c and 3 ceiling fans. Includes gas stove, refrigerator, built-in microwave, washer/dryer (new in 2018) and two new flat screen TVs. Skylights in kitchen and bathroom. Eight piece patio set and storage trunk. Property is smoke and pet free and move in ready.